World Making Card Day Extravaganza! Just Johanna is hosting a huge World Making Card Day event (on 10/6...just in case you didn't know)! :-) Click on the button on the right hand side of my blog to get all the juicy details!! Most of the design team will be hosting their own challenges during the day on their respective blogs. My time slot is from 9pm - midnight EST. I'll create a number of cards, or other items, that will be posted during my three hour time-slot. I'll then ask visitors to join me in making their own creations, which must be made and posted during the same three-hour time period. You'll then post a comment, with a link back to your creation. **NOTE** You'll need to check in at 9pm EST on 10/6 to find out what my challenge will be...it's top secret until then! :-) The best part? Everyone who participates will be entered into a drawing for a number of Just Johanna gift certificates (top prize is a $250 gift certificate!!) and I will also be giving away prizes during my challenge as well!! Check out all the details on the JJ message board and mark the date and time on your calendar! I can't wait for the big day or to see all the wonderful things I know you will all create!! Happy Card Making!! "When things are going well in life we feel happy and joyful, but sometimes circumstances of life may cause us to feel sad, but even at those times we can still experience the joy of the Lord. I'm reminded of the verse in Nehemiah 8:10b: 'for the joy of the Lord is my strength'. " I choose to create a Christmas tree ornament, although my finished piece was quite large, so maybe a holiday house decoration would be a better description! :-) The star was created from two pieces of SU! chipboard, covered with lovely SU! holiday, double sided paper. The star is covered in Real Red cardstock and the edges have been aged. The Old Olive scalloped circle is cut using a Marvy punch and the More Mustard circle with text, showing just a hint of the word "Joy" was punched using a 1 3/8" plain circle punch. Some yummy chocolate grosgrain was added to the top to hide the knot from the silver cording, used for hanging the star. The backside of the ornament, errr, decoration, simply sports the scripture verse I choose to use with this challenge: "Though now you do not see Him, yet believing, you rejoice with "JOY" inexpressible and full of glory, receiving the end of your faith - the salvation of your souls." I Peter 1:8...Can I hear an "Amen!" :-) Love that verse! Feeling inspired? All of us at SALT would love to see what you create, based on the "Joy" theme. Leave a comment here or on the SALT blog with a link back to your web page or gallery. Am totally in love with Just Johanna's new Fall images! They're full of pumpkins, gourds, leaves, and swirly things! ;-) This is one of my favorite images. I like that a number of images have been combined into one stamp, makes for quick and easy creating! This image would look beautiful stamped directly onto a piece of textured cream cardstock and simply colored in for a very elegant look. I decided to go for the coloring/cutting out method for this piece. The card is small, only about 4" x 4". I found these amazing papers at my local scrapbooking store (Wholly Scrap). It's very subtle but there are two papers matted on the Chocolate Chip cardstock base. The bottom layer is a tone-on-tone leaf pattern, in a mostly orange color, and the top is a transparent paper that has the script words written on it. It makes a great look when paired together. I simply cut those two pieces of paper out and held them together with brads. 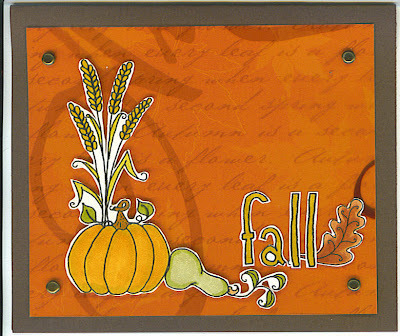 My pumpkin image, "Fall" sentiment, and leaf image has been colored with my Copic Markers, cut out and adhered with my all time favorite Stampin' Dimensionals. Fabulous! 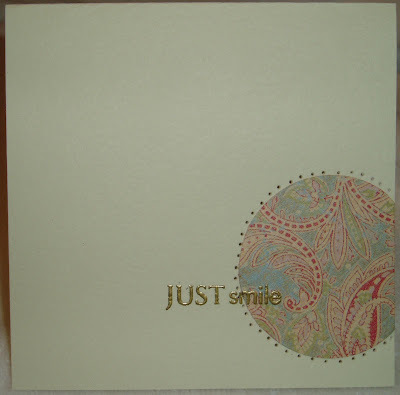 Cardstock and brads by Stampin' Up! New Images Released from Just Johanna! Johanna just released a "wicked" set of Fall and Halloween images! They will be ready for shipment in about two weeks. Run, don't walk, to the web site to check out all of her delightful "concoctions!" Now, I confess that I'm not much of a Halloween person...don't actually do a darn thing on Halloween...well, outside of maybe pick up a big 'o bag of chocolate for little 'ol me! 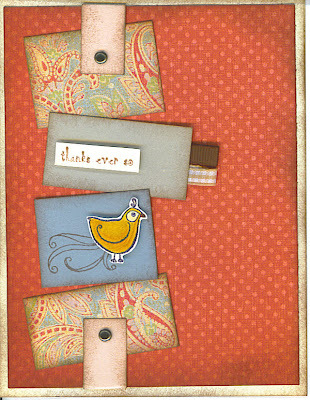 :-) However, I simply could not resist using the very cute phrase, shown above, to create a card! And it is paired perfectly with three little Belle's all dressed up in their finest Halloween garb. How about that patterned paper, it's by Reminisce? Isn't it yummy? Love that it's a Fall paper but uses a vivid purple with the traditional Fall colors. The paper, which is double-sided (both sides shown on this card) was the springboard for all the colors I used on this card. I used SU! 's Elegant Eggplant as the main color and then layered the patterned paper on top. I've seen this "filmstrip" technique a few times and thought it would be a fun element with my little Belle's. The strip is created by punching three squares, trimming the punched piece, and then using SU's spiral punch along both sides. It was a little tricky getting the squares lined up so that the strip wasn't too large for the card but I got the right size after a few tries. My birdies are colored with Copic Markers (oh man, I love them! 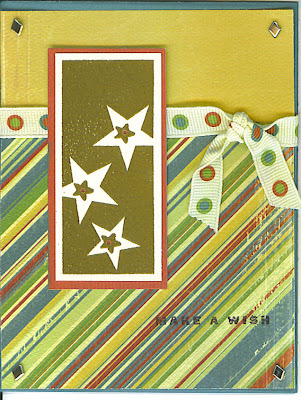 ), cut out and adhered with Stampin' Dimensionals. My "tweet" saying is simply cut out, layered onto black cardstock and adhered with more dimensionals. I added the photo hanger and ribbon as an afterthought but really like the added touch of the purple ribbon. More fun stuff and more new images coming tomorrow so check back!! And don't forget to click on over to the Just Johanna site to see all of the new goodies!! Plain cardstock, embellishments, ribbon by Stampin' Up! This is a card I made for my Dad's birthday and it's the first time I inked up my Papertreyink "Text Boxed" set. The paper is by Crate, as is the matching ribbon. This is delicious paper, pick some up if you have the opportunity. Wonderful patterns, weight, and texture. My star image was stamped with VersaMark and embossed with gold ink. I punched tiny holes in the center of each star so that you can see the red cardstock through the holes. 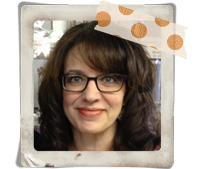 The sentiment is from Stampin' Up! and is stamped on the front in Basic Black ink. A few diamond shaped brads finishes off the piece. Easy peasy! 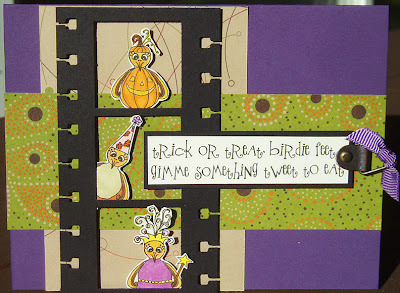 Using my wonderful Just Johanna stamps, I created a card for the Lime Tart Sketch Challenge. You can view all of the wonderful cards created by the other JJ design team members on the Lime Tart site here. For this card I started by stamping and coloring (with those nifty new Copic markers) my cupcake image. 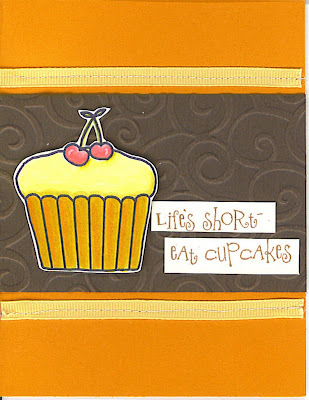 I then stamped and cut out the sentiment, which is oh so true, and cupcake! When creating a card or scrapbook page, many times I start by stamping and cutting out the elements I want to use on my card and, before attaching anything, I lay them out on my background cardstock...moving the elements around, adding layers, or embellishments until I find a pleasing design. I find this really helps to solidify a design or layout, before the glue goes down, and sometimes I'm surprised by brand new design ideas that I hadn't previously considered! Back to the card...I didn't want to overpower the card with patterend paper so I opted for adding a piece of Cuttlebug'd (You know, what happens to paper after it runs through the Cuttlebug...) paper in the background (kind of like swirly cupcake frosting, don't you think?) and attached the cupcake with Stampin' Dimensionals for some pop. I then (Gillian - this is just for you!) dug out my itty, bitty sewing machine (I'm not kidding, it's tiny and cost about $20...domestic goddess I am not) and sewed my ribbon to the card! Wow! I really loved the effect of the sewing and I think I'm hooked! Hooked enough that I may need to turn in my machine that runs on batteries (I'm not kidding) for a real machine! The sewing is very stuble because this was my first attempt and I didn't want to completely ruin the piece. :-) And that, my friends, is how I made my card! 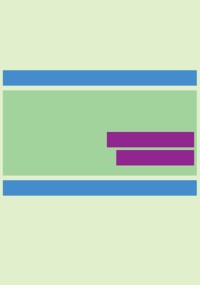 Why not give this layout a try? Leave a comment here or on the Lime Tart blog with a link back to your creation - we'd love to see what you come up with! "So many times we are guilty of breaking promises, or have been on the other end of a broken promise, but what a wonderful blessing to know that when God makes a promise it's steadfast. We'd love to see what Promise from God you choose to use as your basis for your challenge so leave us a comment when you are finished your piece, so that we and others may see your work." 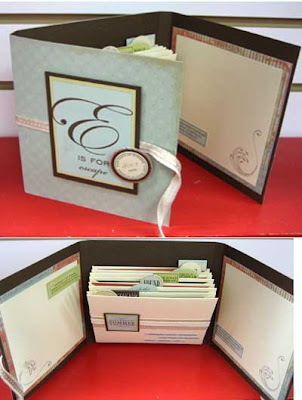 I chose to create a chipboard tag book for this challenge. I thought it would be a wonderful way to capture a few scripture verses that focus on some of God's promises. I used every other page to state the promise, for example, Hope, and then used the opposite page for a scripture verse. I have many pictures to share of the book, a few more below, and as soon as I can get them uploaded to my online photo album I'll pass along the link. All of us at SALT would love to have you play along and create something based on this week's challenge. Please visit the site and leave us a comment with a link back to your blog or online gallery. Thanks!! Last week I picked up an amazing pack of double-sided paper from K&Company and couldn't wait to break into it and use up some of that beautiful paper. Since I haven't had a lot of free time I thought creating a batch of quick cards, for basic occasions, such a birthdays, would be the perfect opportunity to use the paper. I simply cut out a circle with my Coluzzle cutting system, cut off one of the edges, adhered my circle to the card, and pierced around the paper. I then used my PTI stamps to create the sayings and embossed them in gold. All of the cards were made with a lovely textured vanilla cardstock, which looks very nice in person. In total, my batch of cards took about a half hour. 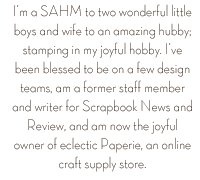 I'm thrilled to announce that I'll begin teaching at my local scrapbook store, Wholly Scrap, at the end of September! I'm so excited to be working with the team at Wholly Scrap, the store has a wonderful supply of scrapbooking goodies and the owners are wonderful! Whether you took a trip to the Caribbean or simply enjoyed relaxing in your own backyard, you'll love having a portable photo album on hand to share photos of your vacation excursions (or at-home BBQ) with your friends and family! During this class we'll use 12x12 cardstock, beautiful vacation themed stickers, and envelopes to create a one-of-a-kind photo album that will hold up to 18 photos! Once you learn how to make these photos albums, you'll be anxious to create one as a gift for friends and loved ones! Also perfect for baby and wedding showers! The cost for the class is $27.00 and will include all materials needed to create the photo album. If you're interested in signing up for the class, please contact Wholly Scrap at the number listed on their web site (link above). You can also view the entire Wholly Scrap class schedule for September here. Any other questions regarding the class, please feel free to leave a comment and I'll contact you privately. This fantastic layout was given to us by one of the design team members, Kerry Urbatch, isn't it fab? Very different and I can think of a million different ways to use those little swatches of paper. I'll probably use this layout again soon but this is my first take on the challange. My card base is a creamy textured cardstock and the top layer is a lovely piece of polka dotted paper from a new pack of paper I picked up at Michael's last week (got some coordinating tags and sayings with this paper too!!). The paisley print pieces are actually the opposite side of the polka dot paper - ohhh....yummy! The solid pieces are from SU! in Sahara Sand, Blush Blossom, and Bordering Blue. Pauline (my cutie partridge) is stamped on Very Vanilla, colored with my new (ohh, I forget to tell everyone that my wonderful husband purchased a set of 72 Copic Markers for my birthday!! How grand is he??) Copic markers, cut out and adhered with Stampin' Dimensionals. I also added a little swirly under Pauline...perhaps she's swiftly walking across my card...The "thanks ever so" is also stamped on Very Vanilla and has also been cut out and attached with Stampin' Dimensionals. My two pieces of Blush Blossom have been attached with two vintage brads and of course the edges of everything has been sponged, aka aged, with Basic Brown. Anyone want to give this layout a try? Leave a comment with a link back to your site or gallery, I'd love to see what you come up with!